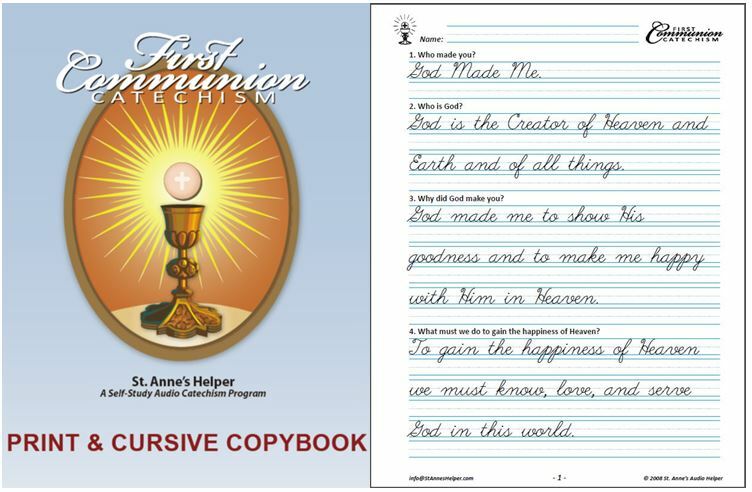 These Catholic First Communion Catechism Worksheets and Copybook include the main Baltimore Catechism No. 1 answers and prayers that you need for teaching the sacrament of the Holy Eucharist. 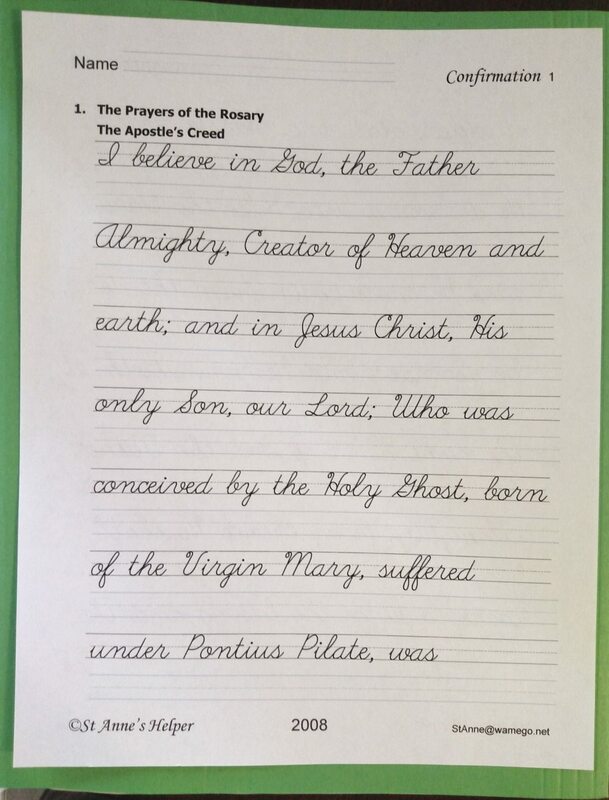 Lovely way to teach catechism and handwriting at the same time! 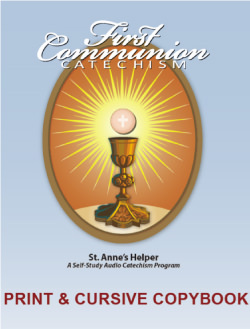 St. Anne's Helper Catechism First Communion Worksheets Copybook Ebook. 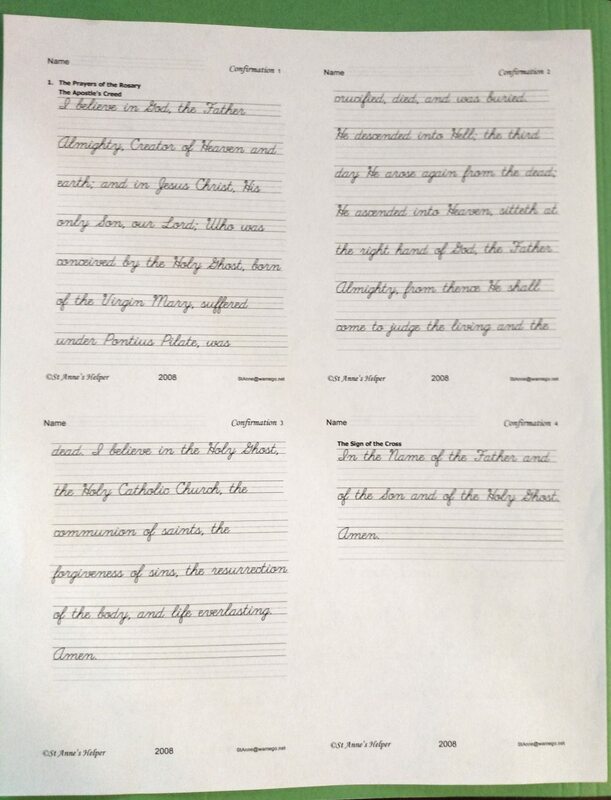 62 Manuscript + 60 Cursive fully printable pages. Two for one! Same price. Same track by track numbering as the Audio CD. You'll have both the manuscript and cursive writing files, two for one. Your choice. Perfect for first and second grade handwriting practice! 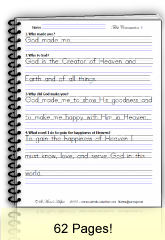 This Catholic First Communion Worksheets or copybook uses the Baltimore Catechism No. 1. Awesome cursive writing practice too! 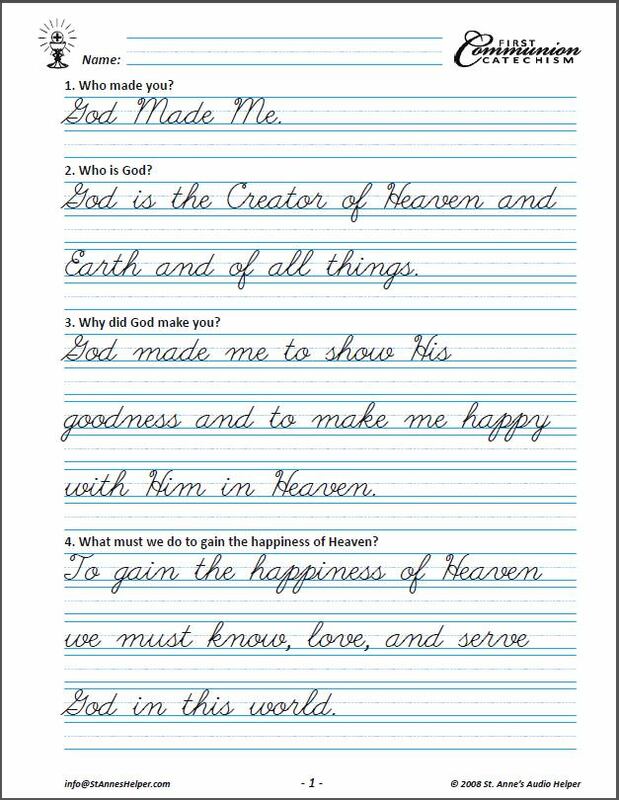 These First Communion Worksheets have the main Baltimore Catechism Holy Eucharist questions. 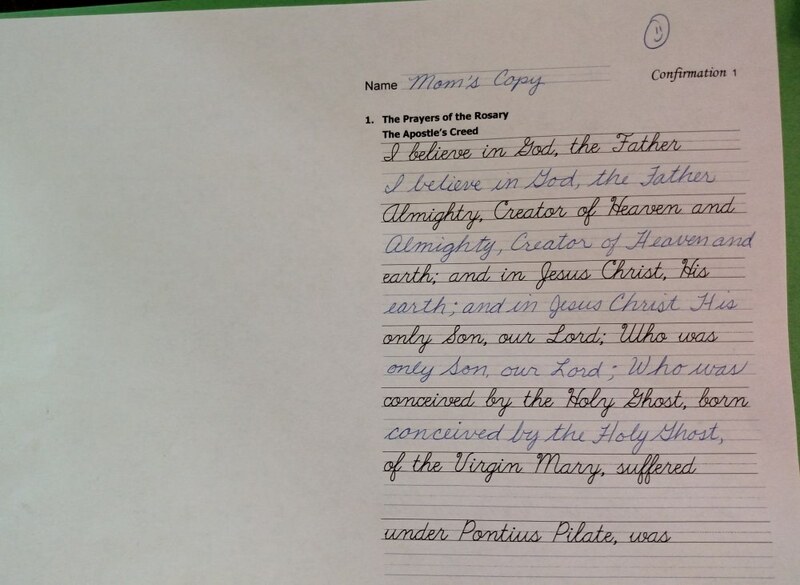 Practice the answers and handwriting! Your Catholic First Communion is the picture of your families will treasure about the Catholic Faith. It is the first moment that you are so closely united to Jesus Christ. You've prepared for months and are finally ready for the perfect day. Help your children prepare well for this awesome moment! 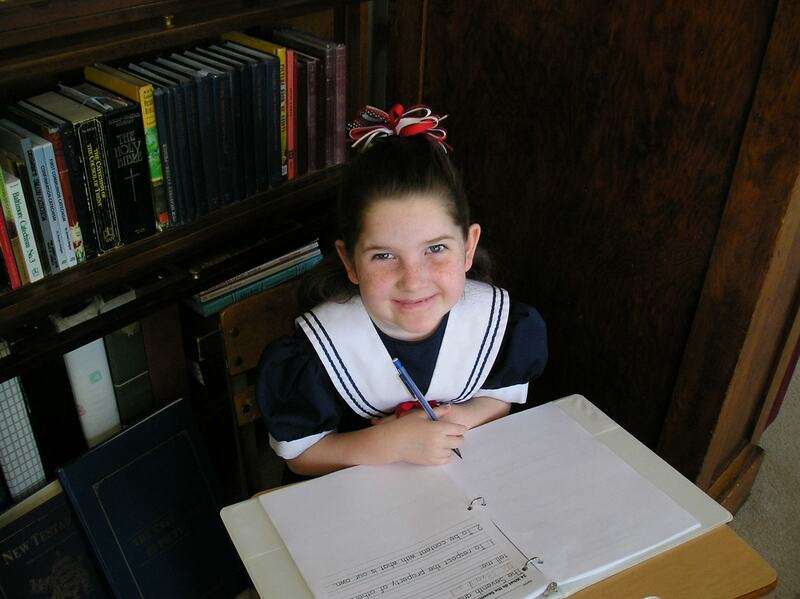 the answers to the Baltimore Catechism questions used for First Communion and First Confession. Start now or prepare for teaching next year. If you are a catechumen, meaning that you're an adult learning the truths of the Faith, and you want an easy way to learn the basics in preparation for Baptism and First Communion, you'll only need the audio or the ebooklet. What is a Catholic First Communion? Simply First Communion is the first time Catholics receive the Holy Eucharist, whether one is a child or an adult. Your First Communion day is the happiest day since the time of your Baptism, because you finally have union with Jesus. Children love that they can do as Mom and Dad and they know that this is a huge honor, so Catholics usually dress their best and celebrate after the Mass and pictures. Ever since the time of Baptism a Catholic goes to Mass every Sunday and Holy Day of Obligation. First Communion is a long awaited event with quite a bit of study compared to some of the other Catholic sacraments. Adults and children who are blessed to live in a family that says the family Rosary already know most of the Catholic prayers, but usually need to learn the Catholic Ten Commandments so they can make a good First Confession. They then learn the basic Catholic beliefs about the seven Catholic sacraments in the rest of the catechism. It's super short, so be encouraged. The main thing to "know" is that the Host is Jesus after the Consecration at Mass. When teaching children about Communion, "It is heartbreaking to look out over the class to see so many who will not have help learning their prayers!" How will they be able to prepare well for a holy First Communion? 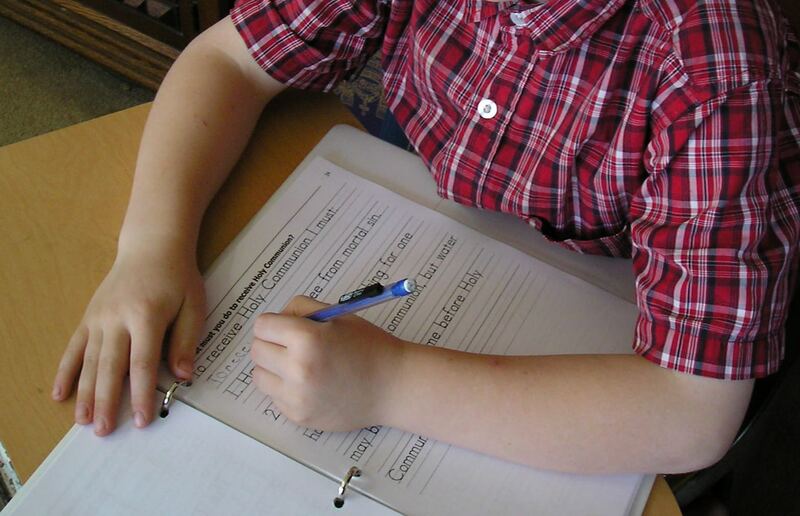 Send them home with these easy worksheets for practice. Yes, you do not pay extra to use these for any class you teach. Pay once and teach for years. Learning the Roman Catholic prayers is easy with enough repetition. Most of the prayers for First Communion are in the Catholic Rosary: the Apostle's Creed, the Our Father Prayer, the Hail Mary, and the Glory Be. Many children and adults can memorize the Hail Mary in the first Rosary since there are 53 Hail Marys in a five decade Rosary. Easy. Share On Pinterest. Thank you!